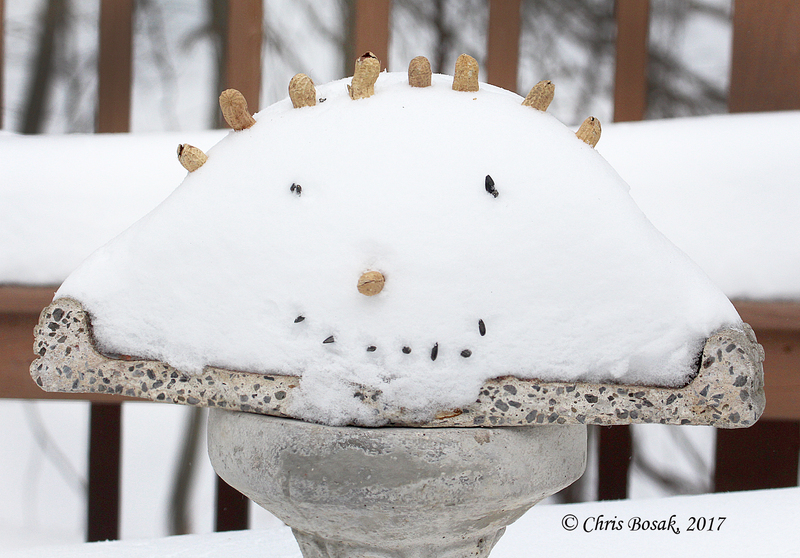 A broken birdbath and several inches of snow made for an ideal canvas to make a face made out of nuts and seeds used to feed birds. It’s supposed to be 70, pushing 80, degrees this week. Although New England can throw us some surprises, I’m fairly confident we are done with winter and spring is ready to bloom. So with that said, here are my last leftover winter photos. I love the photo above. My birdbath bowl broke in half this winter and I didn’t have the heart to throw it away. I used it as a small platform feeder, but when the snow came, obviously it accumulated and covered the seeds. After one of the storms I used some peanuts and sunflower seeds to make a face on the accumulate snow. I was hoping a bird would show up and enhance the photo even more, but no such luck … at least not when I was looking. But it made for a neat photo anyway. 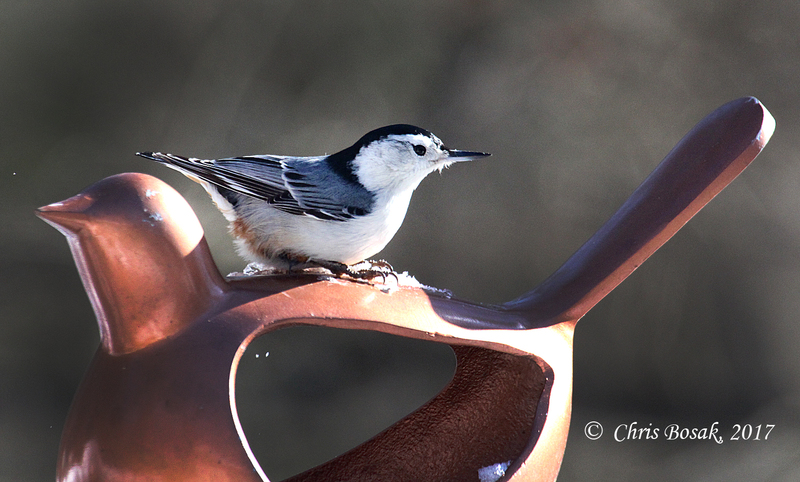 A white-breasted nuthatch sits on a bird-shaped bird feeder during the winter of 2016-17 in Danbury, Conn. 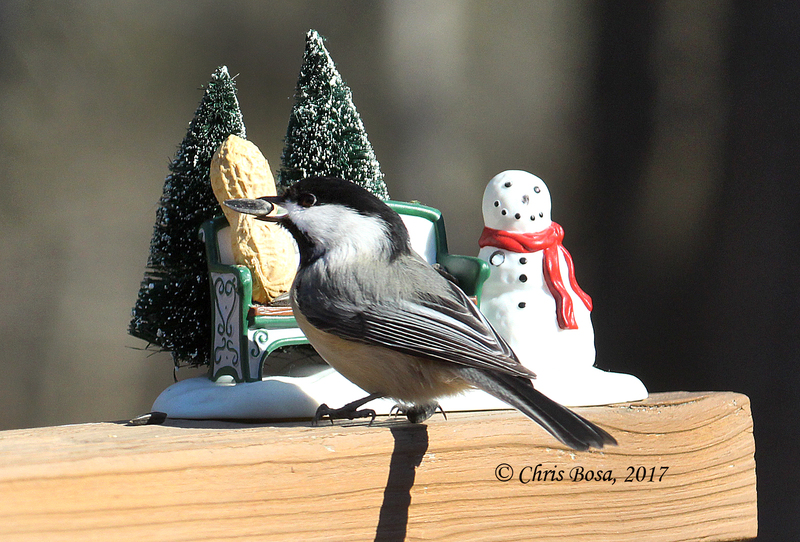 This entry was posted in Random photos, Winter in New England and tagged Black-capped Chickadee, chris bosak nature photographer, snowy birdfeeder, White-breasted nuthatch by Chris Bosak. Bookmark the permalink.